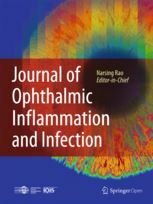 The Journal of Ophthalmic Inflammation and Infection is a peer-reviewed open access journal published under the brand SpringerOpen. It presents current clinical and experimental research on a range of ophthalmic inflammation and infection. Coverage includes original studies, review articles, brief reports, case reports, photo essays and expert commentary on challenging cases. The journal reflects geographical variations in incidence of diseases as well as different treatment modalities worldwide. This is the official journal of the International Ocular Inflammation Society (IOIS), focusing on relevant clinical and experimental research on ophthalmic inflammation and infection. The editorial board includes international experts in the field of ophthalmic inflammation and infection. The journal publishes original studies, review articles, brief reports (including case reports), photo essays and challenging cases commented by experts. The editorial board represents international experts in the field of ophthalmic inflammation and infection.